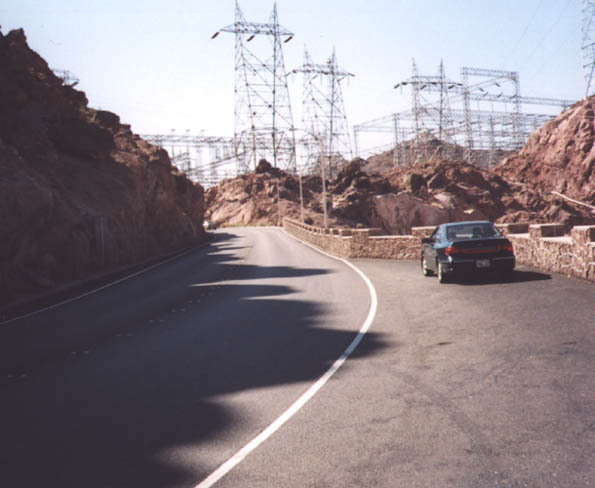 Prior to 2010, U.S. 93 crossed Hoover Dam to connect Arizona and Nevada. There was far less traffic on this day than normal. U.S. 93 leaves the Grand Canyon State of Arizona and enters the Silver State of Nevada. The state line itself is not clearly marked with a sign, but it is visible on the pedestrian facilities. Photo taken 11/12/00. Now past the midpoint of the dam, this sign indicates that it took four years during the Great Depression to construct, from 1931 to 1935. For more information on the history of Hoover Dam, visit the Bureau of Reclamation - Hoover Dam webpage. Photo taken 10/24/03. Now reaching the other side of the dam, U.S. 93 reaches the visitor facilities for viewing the dam. 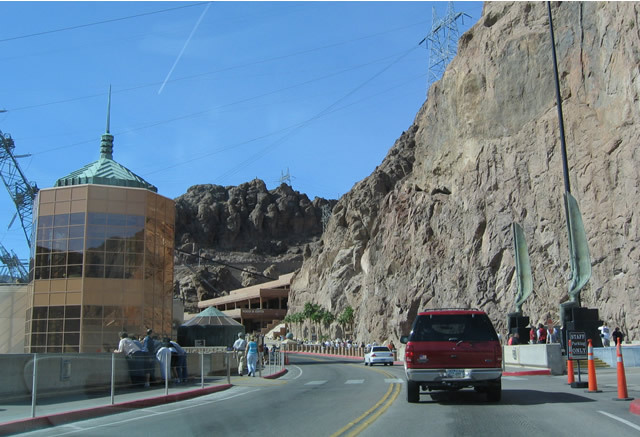 The tower to the left is the visitors center, and the parking area is located just past the center to the right (the parking garage is built into the wall of the canyon). This is a must-see attraction, and the dam tour is well worth it. For side views of the dam, Black Canyon, and Lake Mead, see the Hoover Dam photos at the bottom of this page. Photo taken 10/24/03. Power lines, just like the road, need to take a sharp angle up the walls of the canyon to reach the high desert above. 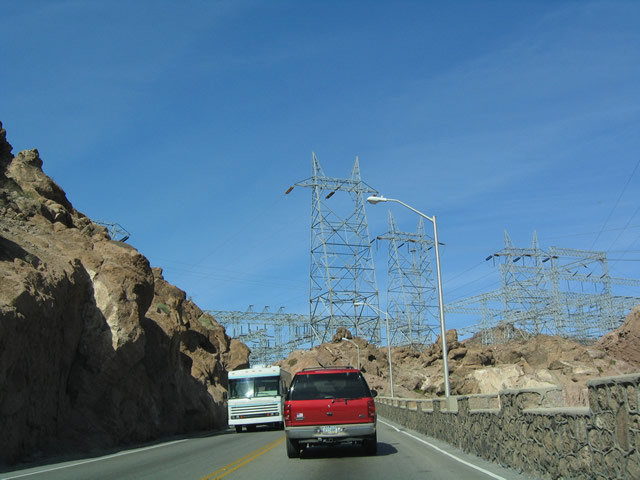 U.S. 93 intersects them a few times since it uses switchbacks to ascend; the power lines use towers that are anchored into the walls of the canyon and pointed down toward the turbine generators. Photo taken 10/24/03. On the Nevada side, U.S. 93 must hug the walls of Black Canyon closely in order to reach the top. Photo taken 10/24/03. 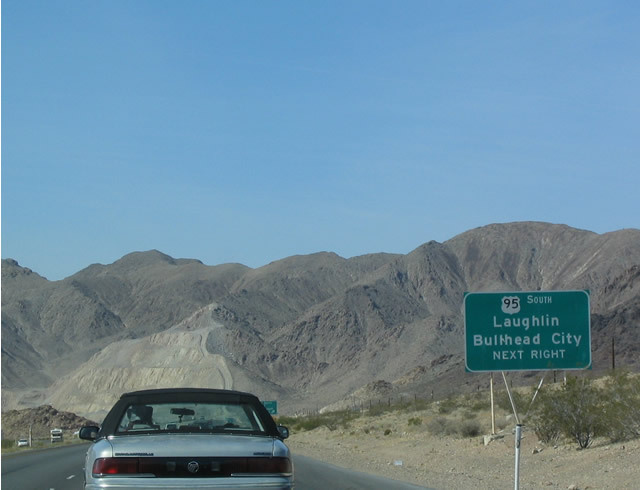 On the way from the dam to Boulder City, U.S. 93 northbound has several switchbacks along the route, as evidenced by signs such as this one. Photo taken 6/97. Northbound U.S. 93 approaches a power substation on the road out of Black Canyon. This was taken from a scenic overlook. Hoover Dam is visible immediately behind the location from which this picture was taken. The same substation is shown in the next photobox, this time from the road. Photo taken 6/97. At the top of the hill sits a large power substation designed to distribute and transmit electricity generated by Hoover Dam to the western power grid. 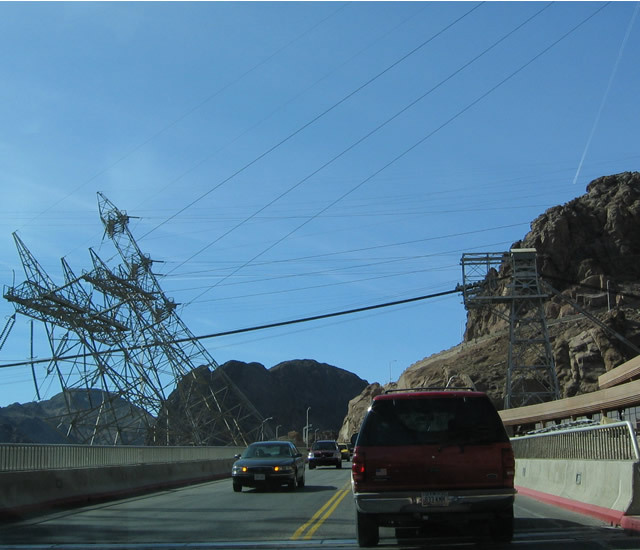 Customers of Hoover Dam's electricity include Southern California, Phoenix, Las Vegas, and the Intermountain West. Power lines transmit electricity to the population centers in the region as well as interconnect with other power generation facilities, such as the Glen Canyon Dam near Page, Arizona; the coal-fire plants in Page and Shiprock, New Mexico; a wide variety of natural gas power production facilities; other hydroelectric facilities; and several nuclear facilities (such as Palo Verde in Arizona and San Onofre and Diablo Canyon in California). Many other substations like this one are located within proximity to the dam and throughout the Southwest to ensure the electricity is properly distributed. Photo taken 10/24/03. This welcome to Nevada sign is situated at the top of the upgrade leading from Black Canyon/Hoover Dam. It is placed almost a mile after the state line, but the sign would not fit in the middle of the dam. Photo taken 10/24/03. 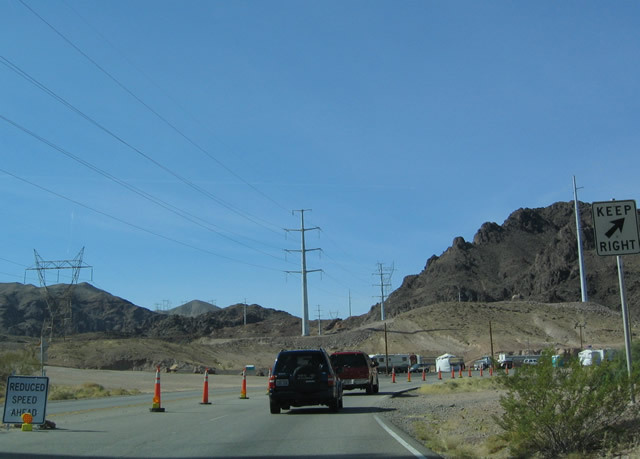 As is the case for travelers entering the vicinity of the dam from the Arizona side, southbound travelers also must pass through a security checkpoint as shown ahead in this photo. Northbound traffic generally does not stop. This is a direct result of the terrorist attacks of September 11, 2001, in New York City, Washington, and rural southwest Pennsylvania. 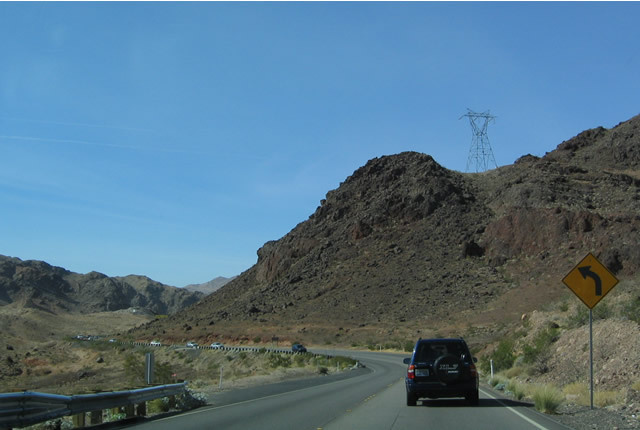 In addition, note the tall power poles that had been recently placed (as of 2003) and provide additional electricity into the Nevada Power grid. 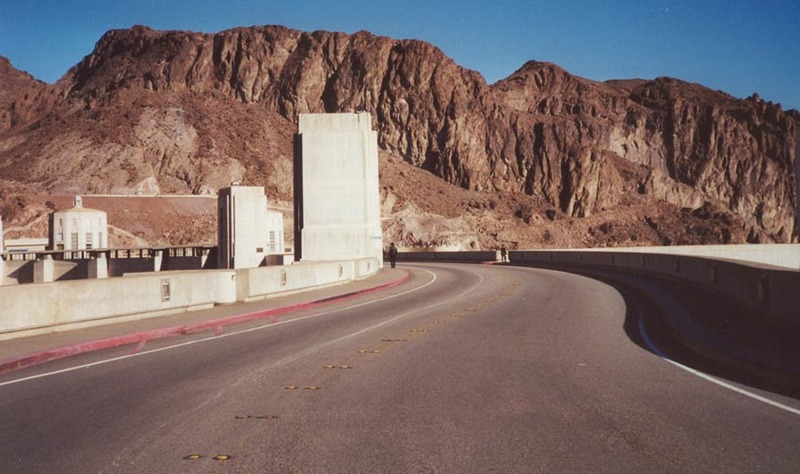 A diamond interchange links Nevada 172 with U.S. 93/Hoover Dam Bypass; however, we have no photos yet to document this connection. Photo taken 10/24/03. Currently, we have no photos of U.S. 93 across the Mike O'Callaghan - Pat Tillman Memorial Bridge (Hoover Dam Bypass), which opened on October 20, 2010. Check back later for updates! Leaving the bypass alignment, U.S. 93 remains narrow as it conforms to the landscape after the inspection station. 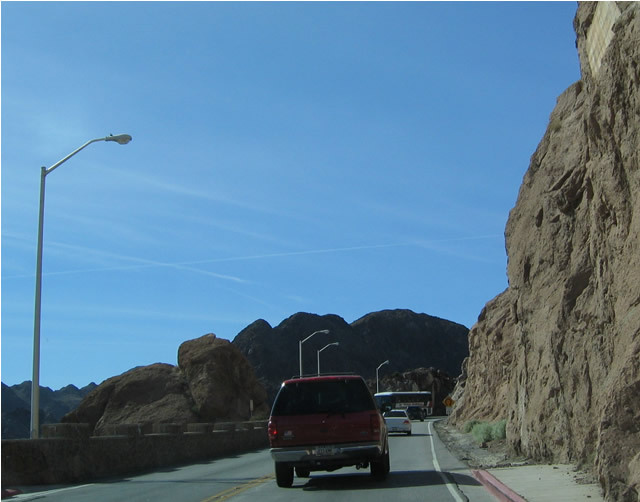 On busy weekends, the trip from the dam to Boulder City may take an hour due to the high volume of traffic. The Hacienda Casino is located just around the bend. 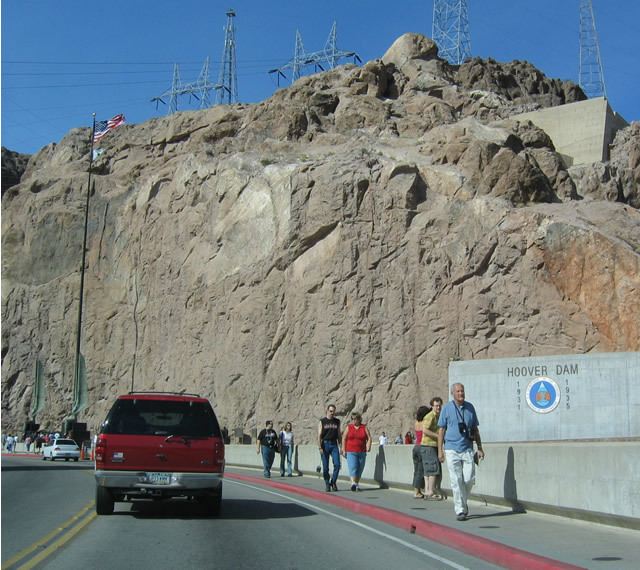 When the Hoover Dam Bypass project is complete, the Nevada approach will hook up with U.S. 93 in this vicinity; the Boulder City Bypass, in turn, will direct traffic south from here around the southern limits of the city. Photo taken 10/24/03. After ascending out of Black Canyon, U.S. 93 encounters its first bona fide casino: the Hacienda Hotel. The Hacienda is notable for several reasons. First, there is no gambling in Boulder City (the Boulder City Charter, approved by the residents of the city, prohibits gaming, which makes Boulder City one of the few cities in Nevada where gaming is specifically illegal ... Carson City is another), so this casino offers a bit of Las Vegas-style gambling before entering Boulder City. Second, the next roadside gambling is located at Railroad Pass, which is a bit of a distance northeast from here on U.S. 93-95. Third, the Hacienda Casino was beset by tragedy in 1998, when it burned down; the facility has since been rebuilt as shown in this picture. Prior to the fire, it was called the Gold Strike Inn, which has been in place since at least 1982. 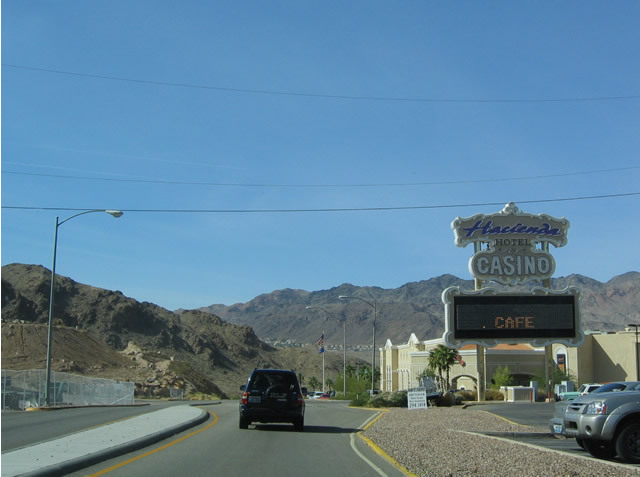 Finally, the Hacienda Casino property has been coveted for years by the National Park Service, which would like to remove the casino from the gateway to Lake Mead National Recreation Area. The price for the park service to purchase such a property would probably be too high due to recent improvements to the property as a result of the fire. For more on this casino, see this Casino City Times article. Photo taken 10/24/03. 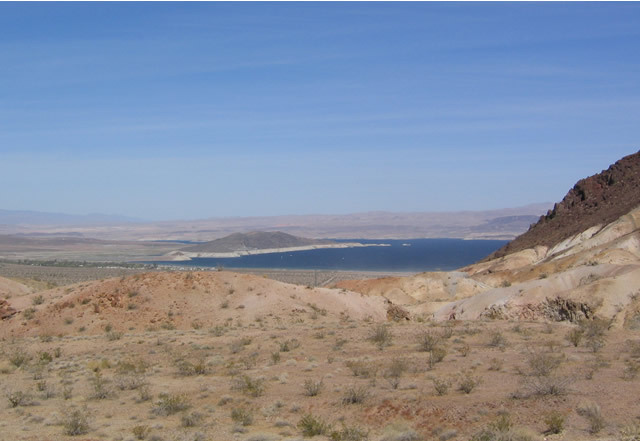 This view of Lake Mead is seen from U.S. 93 just north of the Hacienda Hotel but before the junction with former Nevada 166. As noted earlier, this stretch would be bypassed by the combination of the Hoover Dam Bypass and Boulder City Bypass projects, thus routing U.S. 93 to a new freeway alignment. Photo taken 10/24/03. 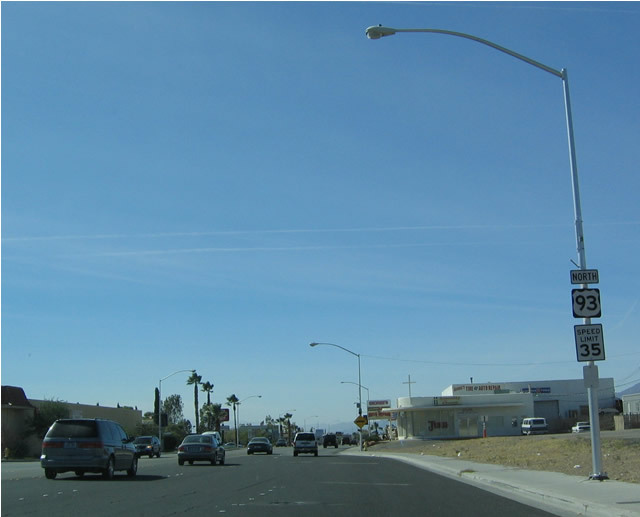 At one time, this intersection along northbound was signed for Nevada 166, but that designation was removed when Nevada DOT turned over maintenance responsibilities. A visitor's center for the Lake Mead National Recreation Area is located along the northeast side of the road just prior to the intersection. Photo taken 10/24/03. 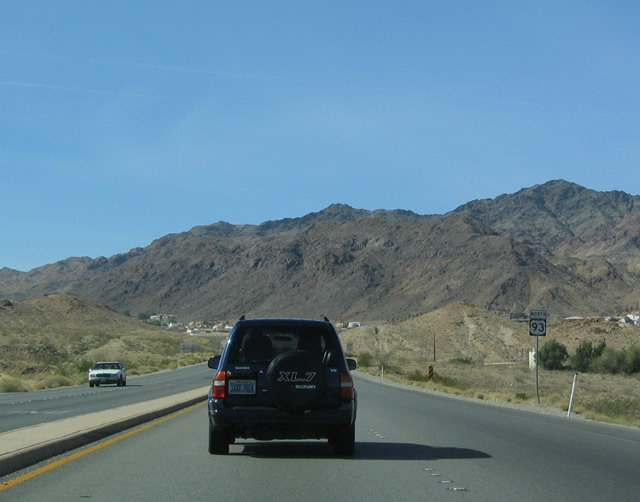 Northbound U.S. 93 retains four lanes as it leaves the Lake Mead National Recreation Area and follows its current alignment into Boulder City, the first city along U.S. 93 in Nevada. Boulder City was founded in 1931 as a base of operations for the construction of Hoover Dam; today it has just shy of 15,000 people. Unlike most other communities in Nevada, gambling is prohibited in Boulder City. Photo taken 10/24/03. U.S. 93 north approaches Nevada Highway (U.S. 93 Business) in one-half mile. Photo taken 10/24/03. 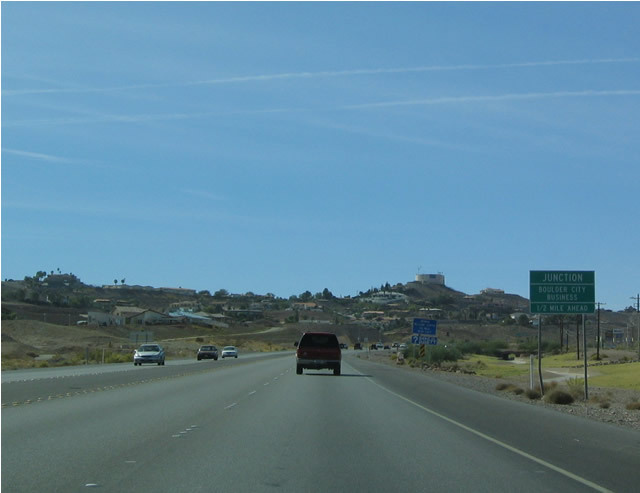 Northbound U.S. 93 approaches the Boulder City Business/Truck Bypass split. This sign was very small and difficult to see. Photo taken 11/12/00. Northbound U.S. 93 meets U.S. 93 Business (former Nevada 500) at the Boulder City Business/Truck Bypass split. 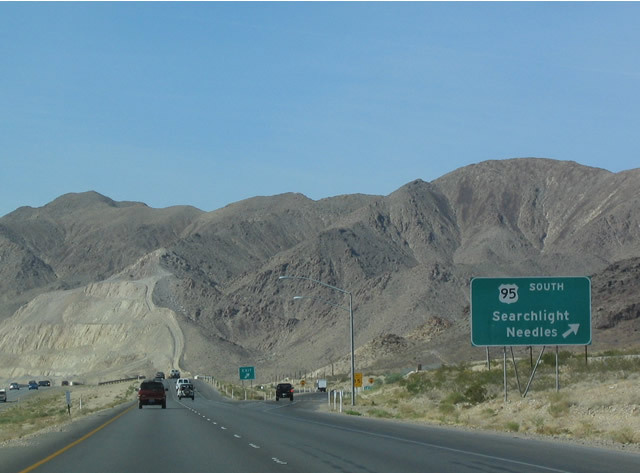 The mainline of U.S. 93 follows the "truck bypass," while the business route (Nevada Highway) is locally maintained (it was formerly Nevada 500, but that state route was decommissioned). 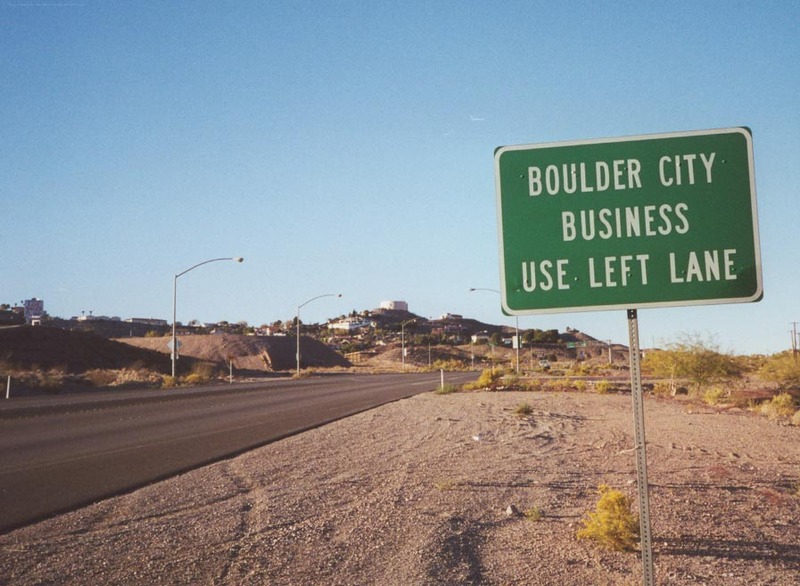 Business Loop signage for U.S. 93 is almost nonexistent through Boulder City. 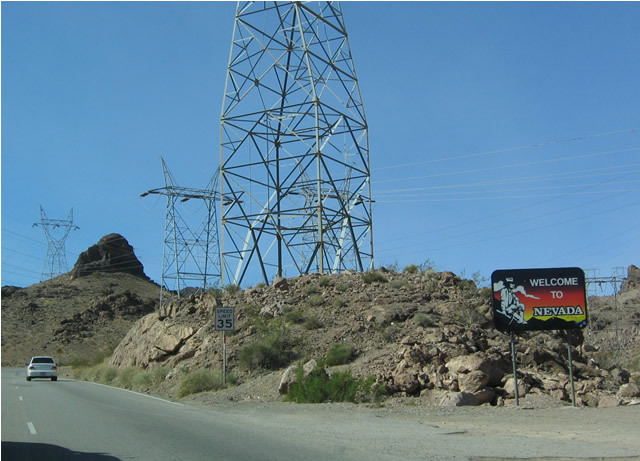 This signage is located on a steep upgrade leading traffic from Black Rock Canyon, which is the location of Hoover Dam. Photos taken 11/12/00 and 10/24/03. U.S. 93 again meets up with U.S. 93 Business at this intersection, but the overhead sign only mentions the lane allocation for Canyon Road, the first right turn. A left turn at this intersection follows southbound U.S. 93 Business into downtown Boulder City. Photo taken 10/24/03. This is the first shield for U.S. 93 after the business and bypass routes rejoin west of Boulder City. There are several commercial establishments on the way out of town before the highway opens up again. Photo taken 10/24/03. 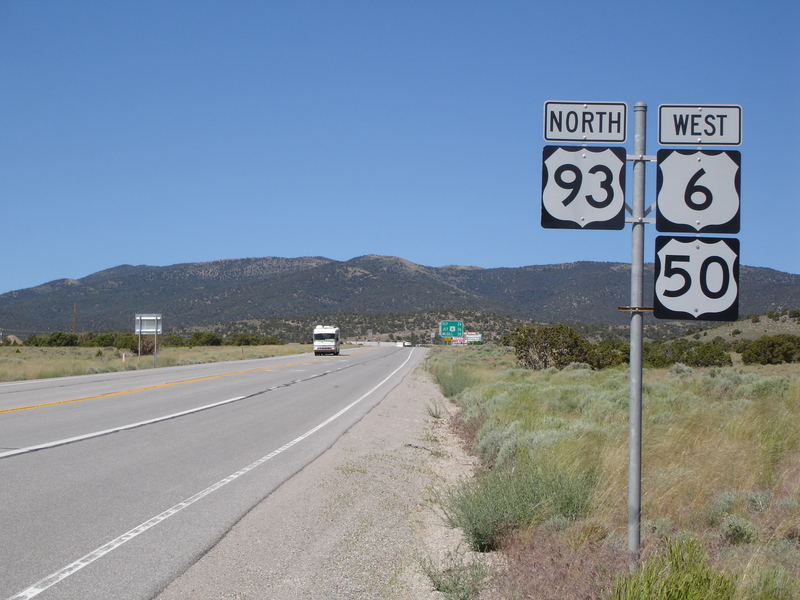 Northbound U.S. 93 approaches its junction with U.S. 95, one mile. 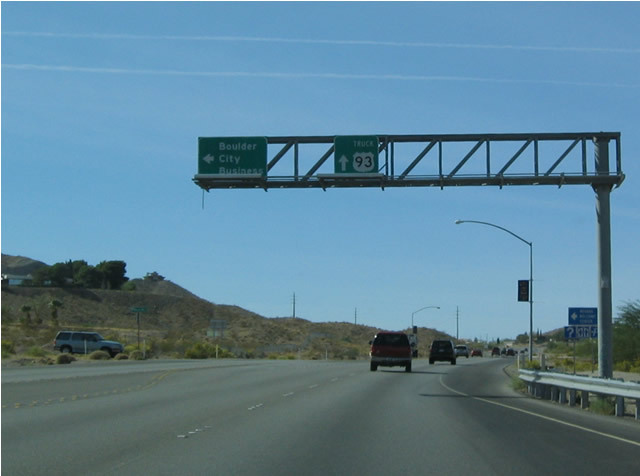 There is no exit number assigned to this interchange, partially because of the uncertainty surrounding potential alignments for U.S. 93 around Boulder City. Now that an alignment around the south side of the city has been selected, this interchange will likely function more as a business route rather than a freeway/through route. Photo taken 10/24/03. 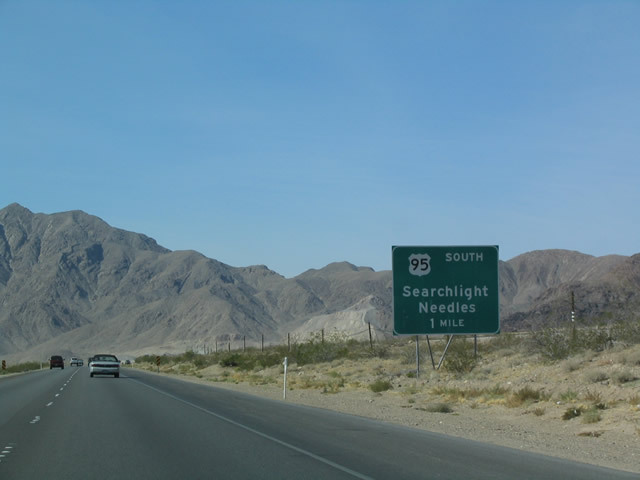 U.S. 95 south leads directly to Searchlight and Needles, California, with connections to Laughlin and Bullhead City, Arizona, via Nevada 163 and Arizona 68. A two-lane highway, it is very busy and is the scene of many accidents. Sam Kinison, a stand-up comedian who was killed in a head-on car crash along U.S. 95 on his way to a sold-out show in Laughlin, was one such casualty in 1992. Photo taken 10/24/03. 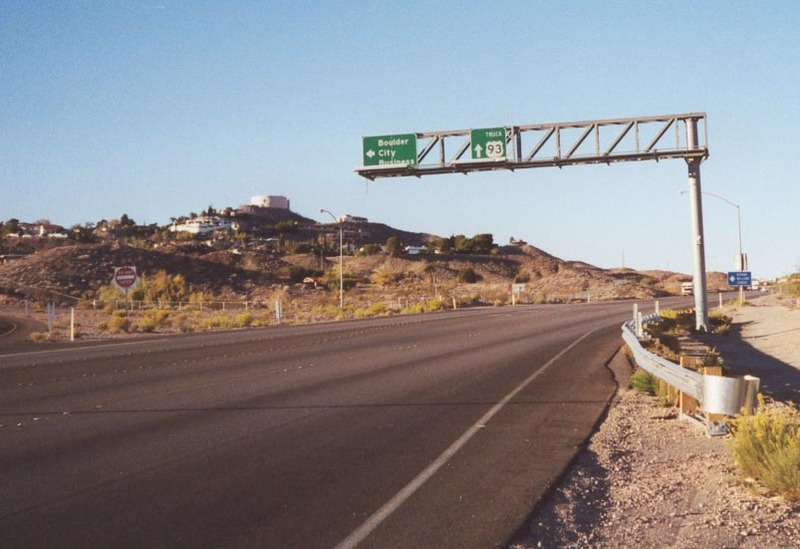 The only interchange on U.S. 93 between Boulder City and Henderson (at least prior to completion of the Boulder City Bypass) is this unnumbered exit for U.S. 95 South. Photo taken 10/24/03. After Majors Junction (where U.S. 6, U.S. 50, and U.S. 93 meet west of Baker and southeast of Ely) is this reassurance shield assembly, which marks all three routes on this stretch of rural highway. Photo taken 06/20/10 by Mark Galbreath. 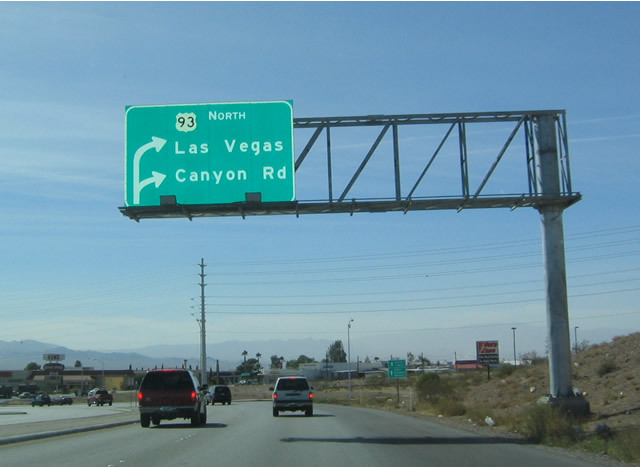 Some distance north of Las Vegas, northbound U.S. 93 meets U.S. 93 Alternate, one of the few remaining signed alternate routes in the western United States. 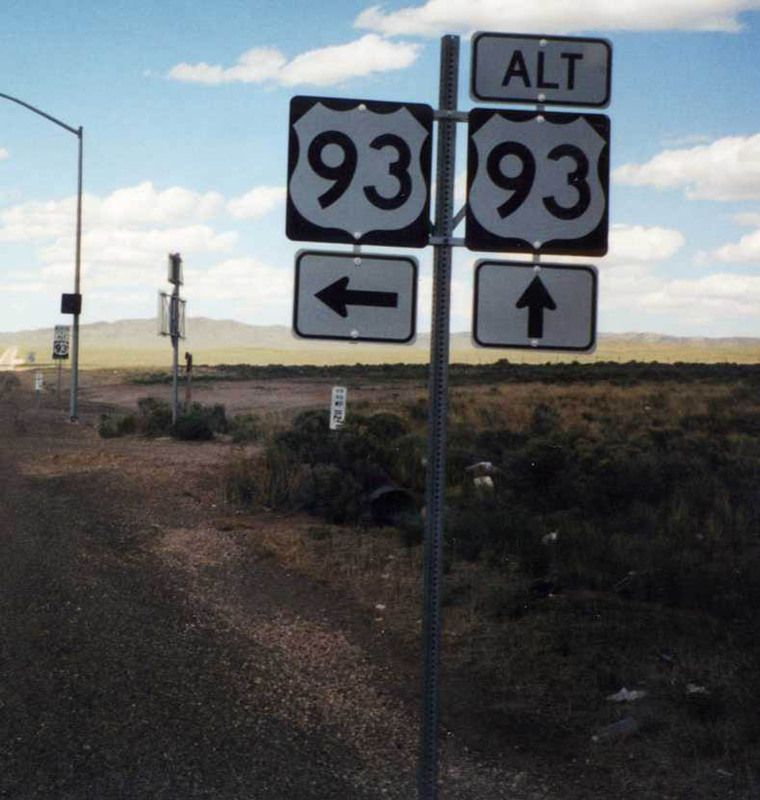 U.S. 93 Alternate connects U.S. 93 with Wendover, then turns northwest to rejoin U.S. 93 at Wells via Interstate 80. The portion of U.S. 93 Alternate shared with Interstate 80 is sporadically signed alongside the Interstate highway. Photo taken by Dominic Ielati (5/00). Page Updated October 30, 2010.